When I started buying freeze dried food, I knew I needed to take my own advice and try the food out rather than just set it on a shelf and call it food storage and hope I liked it when I needed to use it. There are freeze dried fruits and meats and even yogurt, but my favorite freeze dried food for regular use is freeze dried vegetables! Freeze dried vegetables are flash frozen and then the moisture is sublimated out of them in a low heat process, so they retain almost all their original nutrition, stay a similar size and shape as the original food, and are light and crunchy instead of hard like dehydrated foods. They also rehydrate quickly which makes them so easy to use. Because I love them so much, today I’m sharing with you eight delicious ways to use freeze dried vegetables. And for reference, I use freeze dried vegetables from Thrive Life almost exclusively. They are always high quality (fully ripe which means more nutrition) and Thrive has the largest selection of freeze dried vegetables of any food storage company. No more peppers or mushrooms going moldy in your fridge waiting to be used. You don’t need to wash, chop, slice, or dice. You can always use just the perfect amount–no leftovers to waste and no buying an entire bag of celery when you only needed two stalks. If the vegetables are going in a soup or casserole, you can just add them to the liquid and add 2-3 TB extra water for every cup of vegetables and they’ll cook up right in the meal. For some meals you’ll want to rehydrate the veggies first. To do this, put the vegetables in a cup or shallow dish and cover lightly with water. Stir or toss until hydrated–it won’t take long. Each vegetable is slightly different in the amount of water it needs to rehydrate, so you may need to experiment a bit. Just about anywhere a recipe calls for frozen, fresh, or canned vegetables you can substitute freeze dried at a 1:1 ratio. And you can always just cook them up in water and have them as a side dish! Holy cow I love this one. Again, it saves me a ton of time and dishes by cutting out the washing and chopping steps. It also saves space in the cooler! If I’m feeling really crafty, I put together an entire “just add water” meal from freeze dried ingredients. I love the Meals in a Jar Handbook for recipe ideas (although I usually end up swapping ingredients around for the ones my family likes or we have on hand–because that’s how I cook). These meals cook up fast and are perfect for sending with the husband on a last minute fishing trip. It’s tough to mess up “just add water”. Okay, here’s my confession. I love to eat freeze dried corn right out of the can. Dry. It is really tasty, AND it’s far healthier than snacking on candy or chips. Another friend of mine likes to eat freeze dried bell peppers and said they replaced chips for her–crunchy and tasty, but absolutely no added fats, salt, or artificial flavoring. Freeze dried veggies could be added easily to homemade trail mix. Of course there are some you probably wouldn’t snack on dry like onions or celery or spinach, but others like corn, beans, peas, peppers, and cauliflower are great. Want to add the flavor and nutrition of vegetables without your kids knowing they are eating vegetables? Blend freeze dried vegetables into a powder and add them to soups, casseroles, sauces, ground beef, and whatever else you can think of. Maybe even desserts. Kind of like putting shredded carrots into jello, except sneakier. Who wouldn’t love a little variety in their baby food? Any vegetable that is freeze dried can be easily made into baby food by blending the dry food into a powder, just like we did for vegetable powders in #4. When you’re ready to serve it, just add water and you’re set to go! PERFECT for emergency kits and diaper bags. Again, probably not the onions! My toddlers loved freeze dried foods! It made diaper bag snacks so much more healthy. While they liked to eat a variety of freeze dried fruits and yogurt bites, I also packed vegetables like potato dices, corn, and zucchini. You knew we’d get to this one, right? Well, one of the great things about freeze dried food is that food that would normally be perishable now will be just as good in 25 years as it is today! 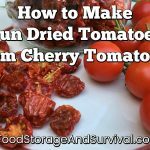 So you can store freeze dried vegetables and use them any of these ways for delicious, nutritious food, any time you want. Vegetables add flavor and nutrients you just don’t get in a rice and beans food storage plan. And when the zombies come, I want to be able to eat well. If you think freeze dried foods are too expensive, ask me how I get them for free or half price! It’s easy. What about you? 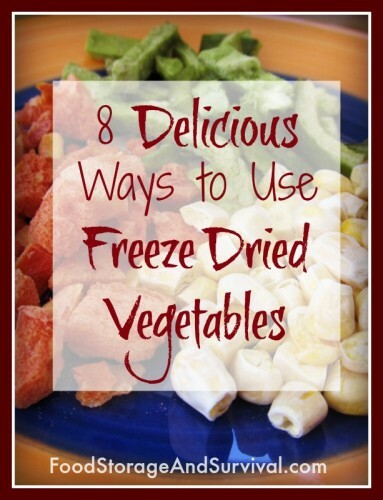 How do you use freeze dried vegetables? Hi Angela, I bought a huge bucket of freeze-dried chopped mixed vegetables from Costco and divided the massive amount into smaller mylar bags. I was disappointed when I rehydrated some and did not like the taste or texture, since I have essentially a lifetime supply! However, when I blended the veggies into some split-pea soup (using the soup as blending liquid), they tasted fine. Saved me a ton of peeling and chopping! Make powder of fruits and take camping to put in oatmeal, mix with tea, spread with peanut butter or use with frosting for cupcakes. Make a mixture of powdered veggies to make instant soup mix.